I’d be lying if I said I wasn’t just a little bit nervous about tomorrow night. I’ve been interviewed for television news programs before, have spoken before large crowds, and even appeared as a guest on Chris Matthews’ Hardball on MSNBC. But, I’ve never done a live radio show before. There will be no retakes. 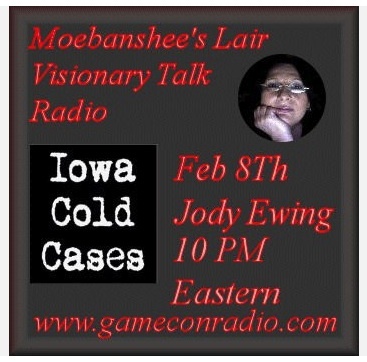 Tuesday night (February 8) I’m the weekly guest on the Internet Talk Radio show Moebanshee’s Lair. The visionary talk radio program was launched by Asylums Gate in June 2008, and covers topics such as the sciences, environmental issues, criminology, history, politics, mysteries and more. I’ve had my hands and feet in a few of those over the past two decades — still have them in a couple. Past guests on Moebanshee’s Lair have included legendary Latin jazz guitarist Eddie Benitiz, anthropologist John Sabol, animal rights activist Amanda Sorvino, retired L.A. police detective & author Steve Hodel (The Black Dahlia Case), and actor Michael Patrick Boatman (Spin City, Arliss,Hamburger Hill). I am humbled. The radio show airs Tuesday evenings from 10 p.m. to 12 midnight eastern daylight time, is hosted by Moebanshee and is carried on http://www.gameconradio.com/. Like I said, I’ve never done this before, but I think you just go to that link and can tune in by a link they’ll provide. And yes, I really am looking forward to talking about that which has mattered to me over the course of my life (so far), and it’s always a good thing reminding people of the many unsolved murders we still have here in Iowa. I will stick Post-It notes on my telephone that say things like “Slow down” and “Don’t speak too loudly.” They only need to hear me on the other end of the line, not in Argentina. And I will be strong. After all, if I can play hardball with Chris Matthews, this should be a piece of cake! I hope you’ll tune in.